This is a review of the book prepared by Prof. Dr. Idris Bostan for the Turkish Undersecretariat of Navigation in order to provide a useful and important scientific resource on the naval history of the Ottomans and the culture and technology of navigation. The book presents the grand work entitled Tuhfat al-kibâr fî asfâr al-bihâr (The Gift to the Great Ones on Naval Campaigns) written by Kâtib Çelebi in 1657 and emphasises the importance of the Turkish activities in the seas and the Ottoman contribution to the navigational history which has been a neglected subject until recently. Review of The Gift to the Great Ones on Naval Campaigns by Kâtib Çelebi, edited by Idris Bostan. Ankara: Prime Ministry Undersecretariat of Maritime Affairs, 2008. Hardcover with case: 464 pages with a CD containing the whole book as PDF files. ISBN-978-975-94785-2-0. Figure 1: Cover page of Tuhfat al-kibâr fî asfâr al-bihâr by Kâtib Çelebi in the edition of Idris Bostan (Ankara, 2008). The impressive book The Gift to the Great Ones on Naval Campaigns edited by Idris Bostan is a great accomplishment for the history of navigation as well as a great reminder of the Ottoman control and supremacy of the seas during from the 16th and 17th centuries. The text of the actual book is accompanied by the enlightening and valuable information provided by the editor which includes a short biography of Kâtib Çelebi, his academic life and works as well as an extensive background information on the book, from the period of its commencement to presentation and later developments. The book also includes the beautiful facsimile copy of the text written in Ottoman Turkish presented to Sultan Mehmed IV (1648-87) and the high quality images of the maps and compasses contained in the manuscript and printed copies. It is definitely a noteworthy resource that will be beneficial to increase the recent interest in the history and culture of the sea, enabling readers and researchers to gain a clear understanding of the Ottoman relationship with the seas and the countless naval campaigns that were undertaken and documented in this important text. Çelebi is presented by the editor as a naturally gifted scholar and a true man of science who wrote twenty-three books on a range of subjects and valued the science of geography immensely. Bostan expresses in his preface that The Gift to the Great Ones on Naval Campaigns is "the first known book on the subject of naval history and the organisation of navigation in the Ottoman Empire until the mid 17th century." further showing the significance of this text and its reintroduction to the world of research on naval history. He also identifies the publication of this version of the book as an opportunity to commemorate Çelebi's three hundred fiftieth anniversary of his death (in 2007) and four hundredth anniversary of his birth (in 2009). Figure 2: The first page of Tuhfat al-Kibar. Topkapi Palace Museum Library, Revan 1192, fol. 1b-2a. The text also enables the reader to gain widespread knowledge on every aspect of Turkish navigation at the time; from biographies of grand admirals to naval wars and the required equipment and supplies of the field as well as ‘forty pieces of advice for the sailors'. This further shows Kâtib Çelebi's great and extensive knowledge of and dedication to the subject and curiosity in passing every bit of detail so it may be of use during his time and later on. One of his main aims as also mentioned by Bostan was to identify the mistakes of the past to ensure that they were not repeated but rather learnt from. He also makes certain recommendations for the success of naval campaigns such as suggesting that the Sultan should lead the important campaigns and points out the mistakes made throughout history and how they may be corrected to achieve more efficient methods. Kâtib Çelebi identifies and praises good military practices both by the Ottoman State and its enemies, suggesting that they should be employed in the future to achieve better outcomes. As a whole, this version of The Gift to the Great Ones on Naval Campaigns prepared by Bostan is an invaluable resource that sheds light on the naval history of the Ottomans and the importance of its recognition, reflecting the high regard placed on the seas, science of geography and naval power at the time. The hard-cover book printed on high-quality paper and complemented with a CD comes in a nice book case and would be an ideal collection item for any library specialising on navigation and its history. Figure 3: Top: A Venetian "Mavna" ship. 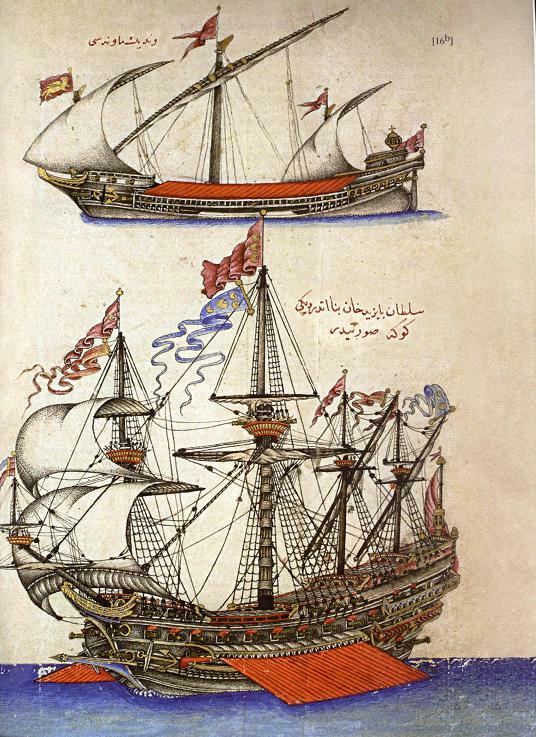 Below: An Ottoman "Goke" ship belonging to the Bayezid II reign (1481-1512). 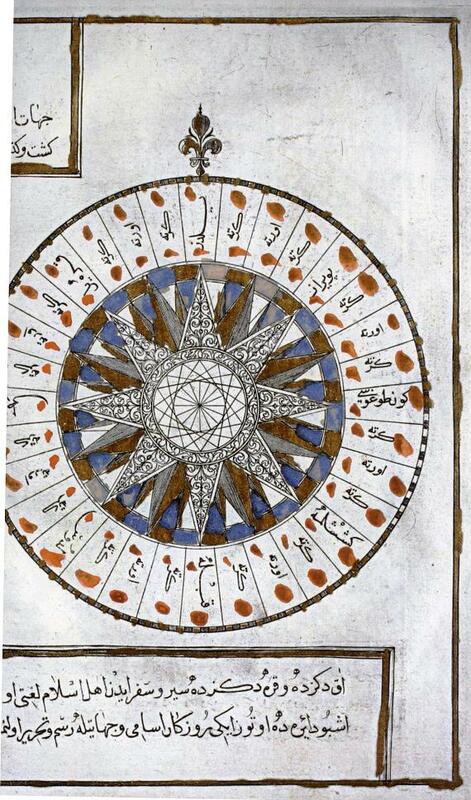 Topkapi Palace Museum Library, Revan 1192, fol. 16ba. Kâtib Çelebi, who is one of the outstanding names of the Ottoman world of scholarship in 17th century and one of the most prolific persons in terms of the number and type of his works during that period, was a man of knowledge, ideas and culture who was widely spoken about in the Ottoman period of the Islamic World. He was a distinguished person whose life, which lasted for forty-nine years rightfully, carries the attributes "erudite" in terms of the diversity and depth of the subjects he was interested in and "prolific" in terms of the great number of works he produced. His biography is in the book Sullam al-wusûl which he wrote himself, his last book Mizân al-Hak and in his other books such as Jihannuma where he mentioned his biography as necessary. Kâtib Çelebi was born in Istanbul in February 1609 (recently, the UNESCO annouced the 400th anniversary of his birth). He was known as "Hajji Halife" among the clerks of the divan and as "Kâtib Çelebi" in the circles of knowledge, but his real name was Mustafa and his father's name was Abdullah. His father, who had been educated at the Enderun School [the Palace School], worked both in the Divan Office and also attended the circles of scholars of his time because of his interest in knowledge. Kâtib Çelebi entered the Anatolian Accounting Office that was linked to the Main Accounting Department as an apprentice next to his father when he was fourteen (1623). He learned the siyaqat style of calligraphy writing, divan numbers, the rules of calculation and writing from the clerks there in a short period of time. A year later, he joined the army that set off for Erzurum to suppress the rebellion of Abaza Pasha in the entourage of the Grand Vizier and Commander Çerkez (Circassian) Mehmed Pasha together with his father. After the defeat and fleeing of Abaza Pasha to Erzurum in the war that took place in Karasu, near Kayseri, they wanted to besiege the city, but Çerkez Mehmed Pasha withdrew to Tokat because of the arrival of winter and the intervention of some intermediaries. He was in the army that set off in 1625 to go to Baghdad together with Hafiz Ahmed Pasha who had been appointed to the post of the of the Grand Vizier upon the death of the Grand Vizier who had started the preparations for saving Baghdad which had been captured by Shah Abbas. He participated in the siege of Baghdad in 1626 and he was greatly influenced by the difficulties experienced in the military campaign which had ended in failure and those experienced on the way back. He talks about his assessments regarding this when necessary in Tuhfat al-kibâr. Kâtib Çelebi lost his father in Mosul in August 1626 while he was on the way back. At that time his father was sixty years old and he was buried in the Jâmi'-i Kabîr cemetery there. This was not all of Kâtib Çelebi's sorrow. A month later, he lost his uncle in Nusaybin. He had to stay in Diyarbakir for a while where he had come with some of his relatives. It was decided that the army would spend the winter in Aleppo. At that time, he was hired as an apprentice to the Office for the Calculation of the Expenses Related to the Cavalrymen, which was a department in the Ministry of Finance, through the help of Mehmed Halife, who was one of the friends of his father. After that, he participated in the second siege of Erzurum which was carried out under the leadership of Grand Vizier Halil Pasha and then Hüsrev Pasha after the dismissal of Halil Pasha against Abaza Pasha who had revolted once again (1627-28). After the revolt was suppressed, Kâtib Çelebi returned to Istanbul with the army in December 1628. At that time, Kâtib Çelebi attended the classes of Kadizade Mehmed Efendi. Soon he left Istanbul together with Commander Hüsrev Pasha to participate in the military campaign of the Ottoman army against Hamadan and Baghdad in order to recapture Baghdad (1039). During these military campaigns, he wrote about the information he gathered on the cities that the army conquered and his own observations. Especially he wrote about the siege of Baghdad and the scenes of war in his history book Fazlaka. When he returned to Istanbul (1631), he continued attending to Kadizade's circles. Figure 4: Inebahti port and the Ottoman Navy. Topkapi Palace Museum Library, Revan 1192, fol. 17a. After a big Safavid army besieged the castle of Van, Kâtib Çelebi joined the Ottoman army that set out together with the Grand Vizier Tabaniyassi (Flatfeet) Mehmed Pasha (1633). It is understood that the army continued on its way even though it was heard in Izmit that the Iranian army had withdrawn upon the coming to help of the governors of Erzurum and Diyarbakir. While the Grand Vizier stayed with the army in Aleppo for the winter, Kâtib Çelebi went to Hejaz in order to perform the obligation of pilgrimage. On his return from the pilgrimage, he attended the circles and lectures of knowledge in Diyarbakir where the army had come to spend the winter. During this military campaign and especially when he was in Aleppo he formed the first components of the bibliography and biography books such as Kashf al-Zunun and Sullam al-wusûl. Finally, Kâtib Çelebi attended the military campaign to Revan together with Sultan Murad IV in 1635. When he returned to Istanbul the following year, he decided not to attend the military campaigns anymore, and to dedicate himself to scholarship. Kâtib Çelebi had attended seven big military campaigns in ten years up to that time. He dedicated the rest of his life to "the big struggle rather than the small struggle" [literally "to the big jihad rather than the small jihad"] and by "big struggle" he meant his work in scholarship. He spent the inheritance he received and all of his material means to purchase books. He used to collect and read mostly books of history, biographies and deaths (wafayat). He lost his mother nearly ten years after the death of his father. He spent all of the inheritance he received from his mother on purchasing books. Two years after that he received another inheritance from a relative of his who was a merchant and again he spent a significant part of it in the amount of 300,000 aspers on books. With the rest of the money, he renovated his house in Fatih district and he tried to obtain the necessary furniture for marriage. So he continued with his scholarly works on the one hand, and was busy ordering his private life on the other. He was around thirty years old at that time. When Sultan Murad IV set off from Istanbul to capture Baghdad in the year 1638, he requested to be excused on the grounds of his scholarly works and he gave up the idea of attending the military campaign. In this long and tiring life of learning which lasted about ten years, Kâtib Çelebi studied without getting tired of studying. He used to stay up until the morning reading with a candle light in order to examine a book he was interested. Meanwhile, he taught the students who wanted to take classes from him and he did not neglect them. The method he followed while teaching these classes was to go from the simple to the difficult, from the parts to the whole, and as a principle not to pass to another branch of knowledge without mastering the one that was being studied. Kâtib Çelebi started writing books at this time. In 1641, he wrote his first book Fazlakat al-akvâl in which he talked about one hundred and fifty states and one thousand five hundred rulers. Although Sheik Al-Islam Yahya Efendi insisted that a clean, final copy of the book should be written and presented to the sultan, he did not do this. Kâtib Çelebi followed the developments in his period closely as well as being engaged with studying and his job at the finance department, he also he took an interest in the events that took place at that time and tried to find solutions. When the war of Crete started in 1645, he began doing research on geography which was a subject that had had interested him before. He examined the books and treatises on map making. Probably at this time he prepared Muntahab al-Bahriya which he formed by the selections he made from Kitâb-i Bahriya of Piri Reis and the maps he utilized from Islamic geographers and some Ottoman historians and geographers. He must have wished to learn the geography of Venice and the European states with which the Ottomans fought and the geography of the Ottoman seas. However, it was also his right to be promoted in the job of clerkship which was his main job. When his application to become scribe in the department where he was an apprentice was rejected, he argued with the head scribe of the department and he left his job due to the anger he felt because his turn had not come yet. He started to live in solitude and kept himself busy with writing books and teaching students for three years. 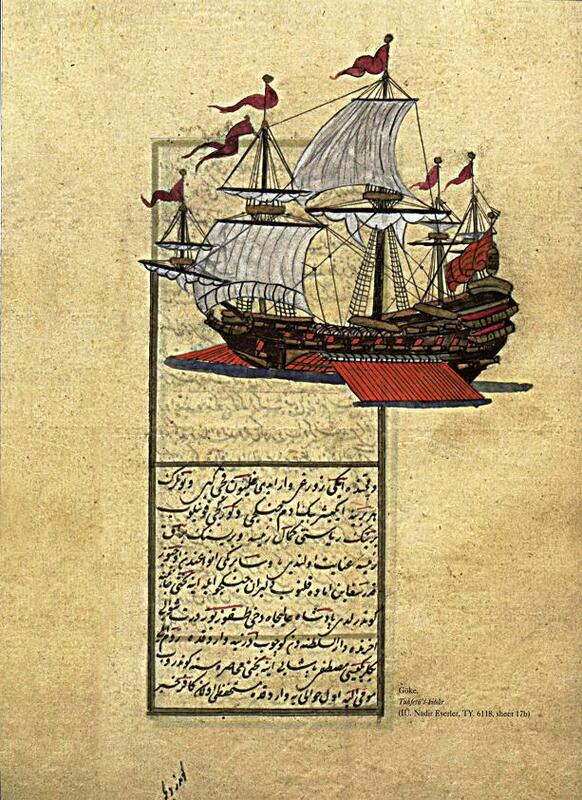 Figure 5: A page from the manuscript and an Ottoman Goke ship. Tuhfat al-Kibar, Istanbul University Library, TY. 6118, fol. 17b. Around that time, Kâtib Çelebi became sick, and examined books such as those on science of letters, on mastics and senses as well as those on medicine for his treatment. When he finally recovered, he taught mathematics, astronomy and geometry to his own son and Mevlana Mehmed who was the son of his neighbour Ahmed Rûmi of Akhisar. However, both of them died shortly, and this caused him to leave unfinished the commentary on Muhammadiyya of Ali Qushji which he had started to write. At the end of 1648, Grand Vizier Koca Mehmed Pasha, whom he visited through the mediation of Sheik al-Islam Abdurrahim Efendi, appointed him as the second scribe to the Office for the Calculation of the Expenses Related to the Cavalrymen despite all the efforts of his opponents. He continued working at this job until the end of his life by going to that office once or twice a week. Kâtib Çelebi died on the morning of Saturday 6 October 1657). Today his grave is in the enclosed graveyard in the Zeyrek-Sebsafa Mosque. Kâtib Çelebi, who was a hard-working person, was known as a taciturn, good-natured man who made many efforts in the fields in which he worked. As a tribute to the editor of the original book, we reproduce in the following two sections of the first part of his impressive publication: chapter 1 on "The Life of Kâtib Çelebi (1609-1657/1017-1067)" (pp. 19-22) and chapter 2 on "Kâtib Çelebi's Life of Scholarship: His Education and Circle of Scholarship" (pp. 23-29). Figure 6: A compass. Source: Müteferrika edition of Tuhfat al-Kibar, Süleymaniye Library, Hekimoglu, No. 710. Kâtib Çelebi started his education around five years of age and he continued studying until the end of his life except for the seven military campaigns that he attended. When he was still a child, he took classes on Qur'an recitation and Islamic Law pertaining to personal matters from Isa Halife of Crimea because of the wishes of his father, he took language and calligraphy classes from Ilyas Hoca and Ahmed Çelebi. At that time, he had memorized half of the Qur'an. In 1628 he returned from the military campaigns which had taken place one after the other, and he continued with his job as a clerk. On the one hand and he attended the circles of knowledge and especially the sermons at the Fatih Mosque and the classes of Kadizade Mehmed Efendi, whose fame had increased at that time, at the building where he taught in compliance with the advice of his father who had recommended this previously. Kâtib Çelebi was influenced by the correct articulation and effective speech skills of Kadizade and therefore his curiosity for reading and learning increased. Kâtib Çelebi, who restarted taking the classes of Kadizade upon his return form the military campaign of Baghdad (1631), took many courses from him again even though he stated that the classes of his teacher, who was not interested in philosophical subjects and who avoided interpretation, were simple and superficial. According to the information he gave in Mizan al-hak fi ihtiyâr al-ahak, Kadizade Mehmed Efendi mostly taught the Qur'an commentary Anvâr al-tanzil of Kadi Baydavî, Ihyau Ulum al-Din of Imam Ghazalî, which was a work on Islamic Law and theology, the commentary written by Jurjanî on Mawakif of Adudiddin Ijî, which was a work on theology, Durar of Mullah Hüsrev, which was a book of Islamic Law, and Tarikat al-Muhammadiya of Imam Birgivî, which was a work on Islamic Law and ethics. Kâtib Çelebi, who did not attend the military campaign that Sultan Murad IV organized to Baghdad in 1638, stayed in Istanbul, returned to scientific pursuits, and studied with the famous scholars of his period for ten years. He started taking the classes of A'raj Mustafa Efendi (d. 1653), who was among the scholars whom Kâtib Çelebi thought very highly of, after the teacher left his job as a judge. He attracted the attention of A'raj Mustafa Efendi in a short period of time. Kâtib Çelebi gave great importance to his classes because of his comprehensive knowledge in the rational and narrative types of knowledge. He became one of the students who were close to him and he attained his friendship. Among the books he studied while taking classes with this teacher were Tafsîr [commentary on the Qur'an] of Kadi Baydavî (d.1286), Sharh Muhtasar al-Muntaha of Adududdin Ijî (d. 1355) which was known as Sharh Adud and which was on the methodology of Islamic Law, Sharh Ashlkal al-Ta'sîs of Kadizade Rumi (d. 1440?) on mathematics, and Sharh-i Chagmini of Kadizade Rumi on astronomy, Aruz-i Andalusî of Abu Muhammad Abdullah al-Ansarî of Andalusia (d. 1154) on the mistakes of prosody and Zij of Ulugh Beg (d.1449) in order to learn how to make a calendar. Later on he attended the classes of Kurdish Abdullah Efendi, who was a public lecturer at the Hagia Sophia and who was knowledgeable in rational and narrative knowledge and Keçi Mehmed Efendi, who was from among the public lecturers of the Süleymaniye Mosque and a specialist on the Arabic language. Finally he studied Al-Risalat al-Shamsiyya of Kâtibi (d. 1377), which was a book of logic with Veli Efendi of Ermenek and he studied Talhis al-Miftâh of Hatîb Al-Kazvînî (d. 1338) which taught the rules of literature under semantics, comparison and metaphor for the knowledge of rhetoric. He also took classes on Nuhbat al-fikar of Ibn Hajar al-Askalanî (d. 1449), which was a book on the hadith methodology, and on Alfiyya of Zeyn al-din al-Irakî (d. 1404) from Preacher Veli Efendi. According to the information given in Mizan al-hak, Kâtib Çelebi also audited some classes. Among these courses and books are: Tafsîr by Kadi Bayzavî (d. 1286) that was mentioned above, Tavzîh of Taftazânî (d. 1390), on the methodology of Islamic Law, a commentary, which was famous with the name Isfahaî, on Tavali al-anvâr of Bayzavî by Shams al-Din Mahmud b. Abdurrahman (d. 1348), which was on theology, Sharh Hidayat al-Hikma which is famous with the name of Kadi Mir himself, Âdâb-i Bah of Adud Al-din (d. 1355) which is on the rules of discussion and debate, Fusul al-badayi of Mullah Fenarî (d. 1431) on the methodology of Islamic Law and the commentary written by Jalal al-Din Dawwanî (d. 1502) on Tahzîb of Taftazânî which is on logic and theology. Figure 7: World map. Müteferrika edition of Tuhfat al-Kibar, Süleymaniye Library, Lala Ismail, no. 311. Kâtib Çelebi valued history like we do in a modern sense today and asserted that most people did not know the real value of this branch of knowledge and thus viewed history as if it were a tale. He expresses his complaint about this saying "who reads and listens to a letter of love and faithfulness?". Kâtib Çelebi emphasizes the importance of the science of geography at the introduction of Tuhfat al-kibâr and explains that the rulers of the state should know the frontiers and borders of the Ottoman State and the states in this region even if they do not know the whole of the Earth. Only then, he explains, can entering the enemy territories and protecting the borders would be easy. The infidels had been able to discover America, which was called the New World, and they had captured the ports of the Indian countries thanks to the importance they attached to this science [he said]. Figure 8: World Map, Müteferrika edition of Tuhfat al-Kibar, Topkapi Museum Library, R. 1195. Kâtib Çelebi knew the highest-level scholars of his time closely and attended their circles. For example, when he talked about his relations with Shaik al-Islam Abdurrahim Efendi, he mentioned that he attended his classes, talked with him on scholarly matters and even presented a treatise to him adding that he [i.e. the Shaik al-Islam] was someone who appreciated him. Kâtib Çelebi even mentioned the gratefulness he felt because of Abdurrahim Efendi's being an intermediary in getting him appointed as the second scribe at the Office for the Calculation of the Expenses Related to the Cavalrymen through his initiative vis-à-vis the Grand Vizier Koca Mehmed Pasha. In addition, Kâtib Çelebi pointed out that he often met with Abdurrahim Efendi and he consulted with him on the subject of history. He took his opinion regarding the dispatch of the soldiers of Crete to Anabolu from the land against the Venetians who had blocked the passage of the navy from Dardanelles in 1647. He also consulted him after the consultation conducted on the subject of starting the construction of galleons and wanted to find out if galleons existed in the navy in the past. Kâtib Çelebi also mentioned that he talked with Shaik al-Islam Bahayi Efendi, he could not obtain satisfactory answers to the questions he asked about three problems, and that he had an argument with the Shaik al-Islam about the method in teaching. Kâtib Çelebi wrote works in branches of knowledge such as history, geography, biography and bibliography and wrote many books on social, cultural and folkloric subjects. 1. Fazlakat al-tawarîh [summary of history]: This is a book which was written in Arabic in the original and its real name is Fazlakat akwal al-ahyar fi ilm al-tarih wa al-ahbar. It is a general Islamic history covering the period from the creation of the universe until 1641. This work has been known as "the Arabic Fazlaka" in order not to mix it up with the Turkish Fazlaka . 2. Fazlaka [summary]: It is a work of Ottoman history that is written in Turkish and that covers the years 1592-1655 . 3. Takvîm al-tawarîh [almanac of history]: It is a kind of chronology that covers the events that took place from Adam until 1648 and that has the character of a table of contents of the Arabic Fazlaka. Some appendices were later added to this work which Kâtib Çelebi said that he wrote in two months, it has been translated into some Western languages such as Latin, Italian and French . 4. Tuhfat al-kibâr fî asfâr al-bihâr [Gift to the Great Ones on Naval Campaigns]: It is the first book written on the history of the Ottoman navigation. Kâtib Çelebi wrote this book in order to lift the negative atmosphere that emerged and affected the statesmen and people after the failure to conquer Crete even though many military campaigns had been conducted in the eleven years starting in 1645. Kâtib Çelebi narrated all the important naval military campaigns and the lives of the grand admirals of the navy from the time of Mehmed II (the Conqueror) until 1656 in order to remind [the statesmen] the old naval victories and he also gave organized information about the naval establishment. Information on the construction and equipment of a ship, the required supplies for this, and the administrative structure of the Arsenal and advice for sailors comprise the important Sections of the work . 5. Dustûr al-amal [the rules of practice]: It was written to research the operation of the Ottoman state, the reasons for the deficit seen in the central state budget and to find a solution to this. This work, whose full name is Dustûr al-amal li Islâh al-halal and which is similar to the treatises written at that time, is a report prepared in 1653 for the benefit of the statesmen even though there was not anyone it could address directly. Three years later it was presented to Sultan Mehmed IV by Shaik al-Islam Hüsamzade Abdurrahman Efendi (1655-56) . 6. Târîh Kostantiniyya wa Kayasira [the history of Istanbul and Emperors]: This work, which is also known as Ravnak Al-saltana, is the translation of the parts regarding Istanbul from a book of world history written by the Byzantian historian I. Zonaras-N. Khoniates-N. Gregoras-L. Khalkokondyles and which covers the period until 1463. The work covers the expansion of Islam, the collapse of the Bulgarian State, the Byzantium, the Seljuk's, the Crusades, and the aqueducts, earthquakes and fires of Istanbul . 7. Mülûk-i Küffâr Târihi [the History of the Kings of the Infidels]: It is a partial translation of the book of European history named Chronik by Johann Carion that he translated together with Mühtedî Mehmed Ihlâsî . 8. Jihannüma [Showing of the Whole World]: It is a book of physical and human geography for the Ottoman country as well as a book of world geography . 9. Lawami Al-nûr [the Lusters of Light]: It is a translation of Atlas Minor of G. Mercator-J. Hondius from Latin that he made together with Mühtedî Mehmed Ihlasî Efendi so as to use as a resource for Jihannüma. Its full name is Lawami al-nûr fi zulumât-i Atlas Minor [i.e. the lustres of light in the darknesses of Atlas Minor]. The work covers the geography and the countries of Europe starting with the North Pole . 10. Muntahâb-i Bahriye [Selections from Kitâb-i Bahriye the Book of Navigation]: It is a work on sources that he made by taking Kitâb-i Bahriye as its basis as a preparation for the writing of Jihannüma or during the military campaign to Crete which had started recently, in order to get to know the Mediterranean Sea . 11. Kashf al-zunun [the Unveiling of Suppositions]: This book in which Kâtib Çelebi gives information on knowledge and sciences in the introduction and which was written in Arabic is the first comprehensive book of bibliography of the Islamic world. This work, whose full name is Kashf al-zunûn an asâm al-kutub wa'l-funûn, was prepared in twenty years . 12. Sullam al-wusûl ila tabakat al-fuhûl [the Means of Attaining to the Stratum of the Excellent Ones]: It is a book of biography written in Arabic on the authors of the books mentioned in Kashf al-zunûn and it lists the names alphabetically. Later on, Müstakimzade (d. 1788) wrote an appendix for this book . 13. Jami' Al-mutûn min jall al-funûn [Collected Texts from Major Sciences]: It is a collection composed of the summaries of and commentaries on twenty-seven works in various branches of knowledge which Kâtib Çelebi taught . 14. Mizan al-hak fi ihtiyâr al-ahak [the Scales of Truth in Choosing the Most True]: It is a book of advice which provides guidance with common sense and recommends adopting a moderate approach for some controversial matters that took place between the people from Kadizade and the people from Sivasî in the middle of 17th century. It is the last book he wrote and also his most popular and most read book . 15. Ilhâm al-mukaddas min al-fayzi al-akdas [the Sacred Inspiration from the Most Sacred Spiritual Power]: This is a treatise Kâtib Çelebi wrote while he was dealing with astronomy in order to answer the three questions of how the timing of worship of daily prayer and fasting would be determined in the poles, whether there was any place on Earth where the sun rose from the West and whether there was any place other than Mecca where one could stand and face the qibla [the direction of prayer] from each of the four directions . 16. Tuhfat al-ahyâr fi al-hikam wa al-amsâl wa al-ash'âr [the Gift to the Chosen from Wisdoms, Proverbs and Poems]: This is an encyclopaedic dictionary that contains philosophical and literary jokes, various legends, interesting facts about the world of animals, anecdotes and proverbs . 17. Irshâd al-hiyâra ila târîh al-Yunan wa Al-Rum wa Al-nasara [the Best Guidance to the History of the Greeks, the Byzantines and the Christians]: It was written in order to inform the Ottoman scholars about the European's understanding of religion, and their situation in the political, administrative and social spheres . 18. Durar Muntasira wa Gurar Muntashira [the Victorious Pearls and the Widely Spread Glows of the Dawn]: It is a collection that contains beneficial information on many subjects such as intention, the qibla, food and the etiquette of eating, worship, fear and hope, chess, contentedness and wittiness . Other than these works, Kâtib Çelebi mentioned the following in his autobiography: a commentary named Tafsîr Kadi Bayzavi Sharhi, Muhammadiyya Sharhi which was a commentary he wrote on the work of Ali Quiscu, Rajm al-râcim bi's-sin wa'l-jîm which is composed of the fatwa [religious edicts] of some Sheik al-Islams, Kânunnâma and Tutune dair bir Risale [i.e. a Treatise on Tobacco]. However no copies of these works have been found in the libraries . Prof. Idris Bostan teaches at Istanbul University Faculty of Letters, Department of New Period History, is the Head of the Department of Research on the Mediterranean at Institute of Social Sciences and is a consultant of the Undersecretariat for Maritime Affairs. He has surveys on the reflections of maritime affairs on the social and economic life as well as the Maritime Policies, Sea Trade and Technology of the Ottoman Empire. Some of his works were published under the names Osmanli Bahriye Teskilati: XVII. 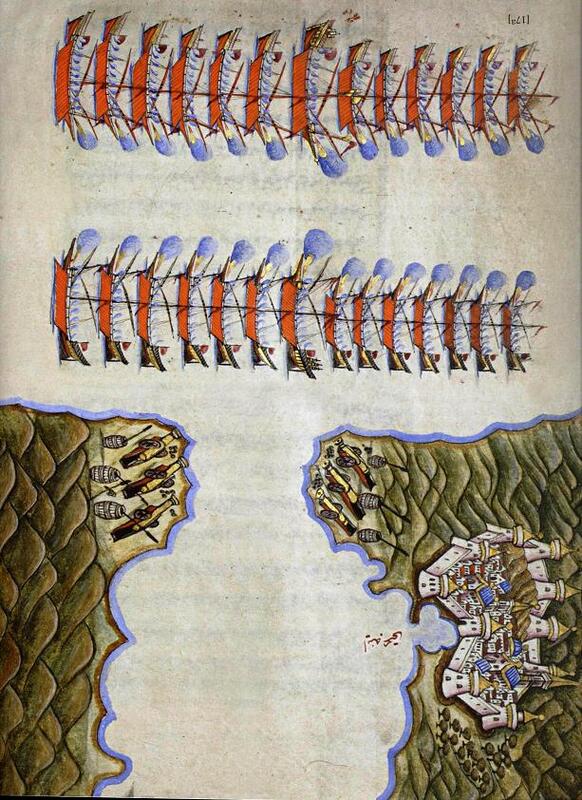 Yüzyilda Tersane-i Amire (Ottoman Navy Organization: The Arsenal in the 17th Century) (Ankara 2003), The 1565 Ottoman Malta Campaign Register (Malta 1998 together with A. Cassola and T. Sheben). Kurekli ve Yelkenli Osmanli Gemileri (Ottoman Rowing Boats and Sailboats) (Istanbul 2005) and Osmanlilar ve Deniz (the Ottomans and the Sea) (Istanbul 2007). Books that were prepared under his editing on the subjects of the Management of the Aegean Islands. The National Committee of Strategic Research and Studies (YOK, Higher Education Council) published Aegean Islands with Maps and the Invasion of the Islands. He teaches on the subjects of Ottoman Naval History, the Administrative Structure of Ottoman Maritime Affairs, the History of Naval Trade, Southern Policy of the Ottoman Empire and it Presence in North Africa, the implementation of trade in the sea until the periods in which the Black Sea was opened to international trade and he has various articles and research. Prof, Bostan is about to complete research on Adriyatik'te Korsanlik: Osmanlilar, Uskoklar, Venedikliler (1575-1620) (Piracy in the Adriatic the Ottomans, Uskots and Venetians) for which he has used the documents of Venice, Spain and the Ottoman documents in Istanbul; and XVI. Yüzyil Osmanli Baskentinde Elçiler (Ambassadors in the Ottoman Capital in 16th Century). Aydüz, Salim: Ottoman Contributions to Science and Technology: Examples from Geography and Astronomy. Aydüz, Salim: Transfer of Modern Science and Technology to the Ottoman State. Aydüz, Salim: A New Book on the Ottoman Military History: Guns for the Sultan by Gábor Ágoston. Bostan, Idris: Ottoman Maritime Arsenals and Shipbuilding Technology in the 16th and 17th Centuries. FSTC: Zheng He - the Chinese Muslim Admiral. FSTC: Piri Reis maps America. FSTC: Piri Reis and the Book of Sea Lore (Kitab-i Bahriye). Goodrich, Thomas D.: Better Directions at Sea: The Piri Reis Innovation. Hagen Gottfried, Ein osmanischer Geograph bei der Arbeit: Entstehung und Gedankenwelt von Katib Celebis Gihannüma [An Ottoman Geographer at Work: On the Composition of Katib Celebi's Gihannüma]. Berlin: Schwarz, 2003. XI, 531 pp., 25 cm ("Studien zur Sprache, Geschichte und Kultur der Türkvölker", Bd. 4; Hochschulschrift: Zugl. : Berlin, Freie Univ., Diss, 1996). 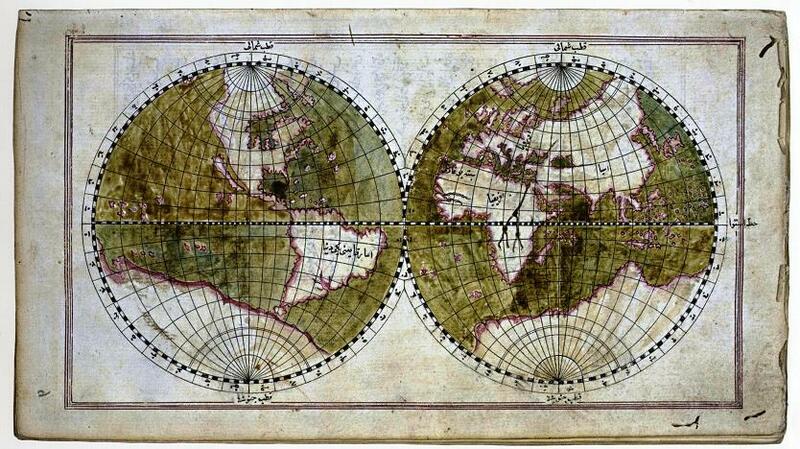 [Old Maps Of Japan], Halife Mustafa Katib Çelebi (1609-1657). Saik Gökyay, Orhan, "Katib Celebi… known also… as Had_j_d_j_i Khalifa", Encyclopaedia of Islam, Second Edition. Leiden: Brill, tome IV, 1978, pp. 791-792. Tekeli, Sevim: The Earliest maps of America. Senior Researcher at the Foundation for Science, Technology and Civilisation, UK and Research Visitor at the School of Languages, Linguistics and Cultures, The University of Manchester, UK. The only copy of the work written with the handwriting of the author is in Bayezid Devlet Library, No. 10318. The edition that was published in two volumes in Istanbul in 1286-1287 has many errors. The latest research on the Fazlaka and the text that was established most recently was prepared as a doctoral dissertation by Z. Aycibin. The book was published by Müteferrika in (1146) but the edition prepared by Ali Suavi together with notes and appendices (Paris 1291/1874-5) could not be completed. For the appendices of Takvîm al-tawarîh and its translations into foreign languages see Aycibin, Fazlaka, p. XLII. The work, which has a lot of manuscripts in the libraries, was published in Ottoman Turkish twice in the printing houses of Müteferrika (1141) and Bahriye (1329), it was published in modern Turkish using the Latin alphabet after it was simplified and notes were added by O. S. Gökyay (Istanbul 1973, 1980). For more information please see the remarks about Tuhfat al-kibâr fi asfâr al-bihâr in this book. For the manuscripts of the treatise, its translation into German and its editions see. Gökyay. Kâtip Çelebi, pp 82-84; Aycibin, Fezleke, pp. LIX-LXI. The only copy of this work is at Konya Izzet Koyunoglu Library, No. 14032. The only copy of the work is in Konya Izzet Koyunoglu Library, No. 14031. For more information and revisions about the work which was introduced by the name Târîh-i Frengî Tercümesi by Gökyay, see Aycibin, Fezleke, pp. LII-LVI. It was published by Müteferrika (1145) except for the part on the Rumelia territories of the Ottoman Empire. For more information on Cihannüma see F. Saricaoglu, "Cihânnümâ ve Ebûbekir b. Behrâm ed-Dimeskî-Ibrahim Müteferrika", Bekir Kütükoglu'na Armagan, Istanbul 1991, pp. 121-142. The author's copy is in Nuruosmaniye Library (No. 2998) and for its other manuscript copies see Gökyay, Kâtip Çelebi, pp. 75-76. On the definition of the work and an evaluation of its sources see F. Saricaoglu, "Pîrî Reis'in Kitâb-i Bahriyye'sinin Izinde Kâtib Çelebi'nin Yeni Bulunan Eseri: Kitâb-i Müntehab-i Bahriyye", Türklük Arastirmalari Dergisi, 15, Istanbul 2004, pp. 7-57. For another view that does not agree that the work belongs to Kâtib Çelebi see Mine Esiner Özen, "Piri Reis ve Müntehab-i Kitab-i Bahriye", Osmanli Bilimi Arastirmalari, VII/2, Istanbul 2006, pp. 119-130. This work was published in two volumes by S. Yaltkaya-K. M. Rifat in Arabic (Istanbul 1971); G. Flugel published it in seven volumes together with its translation into Latin (Leipzig-London 1835-1858). The only manuscript and complete copy of the work is in Süleymaniye Library, Sehit Ali Pasha Section, at no. 1887. The only manuscript copy is in TSMK, Emanet Hazinesi, at no. 1763. 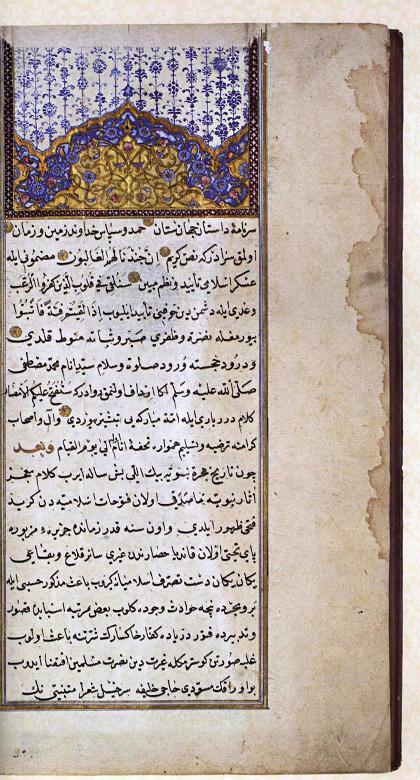 This work, which has eighty known manuscripts in the country and abroad, was published in three editions in Ottoman Turkish (1281, 1286, 1306), it was published in newspapers in instalments twice (Tasvir-i Efkar/1280, Mecm'a-i Ulûm/1296), it was simplified and published with the Latin alphabet by O. S. Gökyay (Mîzanü'l-hakk fi ihtiyari'l-ehakk, Istanbul, 1972) and S. Uludag-M. Kara (Mîzânu'l-hak fi ihtiyâri'l-ehak/Islâmda Tenkid ve Tartisma Usûlü, Istanbul 1990). Also see Aycibin, Fezleke, pp. LXVI-LXXI. Kâtib Çelebi wrote this work because he could not get a response to these three questions from Sheik Al-Islam Bahai Efendi. A translation of this work has been published by B. N. Sehsuvaroglu with the title "Ilham al-Mukaddas min-al-fayz-al-Akdas Risâlesi ve Kâtip Çelebi'nin Ilmî Zihniyeti Hakkinda Birkaç Söz" (Kâtip Çelebi Hayati ve Eserleri Hakkinda Incelemeler, Ankara 1985, pp. 141-176). For the manuscript copies see Gökyay, Kâtip Çelebi, pp. 76-77. For the two known manuscript copies of the work see Gökyay, Kâtip Çelebi, pp. 79-81; Aycibin, Fezleke, p. LXXIX. For the manuscript copies see Aycibin, Fezleke, p. LXXIV. The copy with the author's handwriting is in Nuruosmaniye Library at No. 4949. The last comment on these works was made by Aycibin (Fezleke, p. LXXXII).